At Endoca, we sell 100% certified CBD. All products are all organically produced, and we control the entire process from seed to shelf. Because we have full control of the manufacturing process, we are proud to say that our products are of the highest quality you can buy. We believe in transparency, and we back up our claims with facts, not hype. The hemp we use is grown organically in Denmark; a country renowned for its high standards in soil care and low levels of pollution. This makes us different from other manufacturers who source their hemp from China, or make their CBD products from the leftovers of the hemp fibre industry. Endoca has been in the CBD business since the beginning in 2006, when no one had really heard of CBD or its potential health benefits. We have been pioneers in CBD extraction and purification, and we strive to lead, where other companies follow. Endoca is one of the few companies to be awarded a GMP certificate, which means that we work with 100% certified cbd. Good Manufacturing Practice (GMP) is a system for ensuring that products are consistently produced and controlled according to quality standards. It is designed to minimize the risks involved in any pharmaceutical production that cannot be eliminated through testing the final product. Ask any other producer you are considering to purchase from for their GMP certificate number - if they have one. 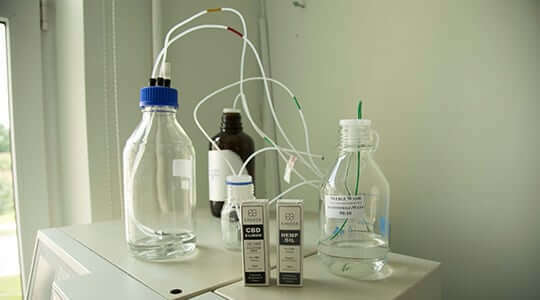 Many CBD companies, CBD manufactures and CBD distributors are just links in a chain. They buy their plants from another grower or wholesaler before production, or they buy their CBD oil in bulk from a bigger company and then rebrand it as their own. This creates a danger for you as a consumer, as the companies selling the product can’t guarantee the whole manufacturing process of their products. If companies don’t follow the necessary GMP precautions when handling their CBD oil, contamination can easily occur as they transfer the product from one container to another during the repackaging process.